Once again we have come upon a cheap and "everyday" phone, a phone designed to do the very basics, and nothing else whatsoever. The LG Select can make phone calls, send and receive text messages, handle memos and has some basic organizational applications such as an alarm clock and calendar. So is your $59 (contract free, on contract the phone is $10) worth spending on the LG select? We're about to find out. The LG Select is a better looking phone then many of its fellow cheap flip phones. The grey and silver design works very well visually and the build quality feels durable and well constructed — in short the phone can take a few falls and knocks from time to time and come out none the worse for wear. It is not the slimmest phone around with dimensions of 94 x 47 x 18 mm, and it weighs a very solid 92 g, so you're not getting the lightest or most compact flip phone for your money. At the front we have a 1 inch CSTN screen capable of showing 10,000 colors and a square 1.3 MP camera lens, also the two small cuts that represent the loudspeaker grill. On the left side we have the 2.5 mm headphone jack which is there strictly for the purpose of facilitating hands-free calling, the volume rocker and USB 2.0 port. The right side contains the dedicated camera key, while the back is completely devoid of life. Flipping open the phone reveals the 2.2 inch TFT screen capable of displaying 262,000 colors and it has a resolution of 176 x 220 pixels, so that's some pretty low end stuff happening here. The four-way navigation key is flanked by two soft keys, a dedicated loudspeaker key, a dedicated voice dialing key, the Call and End call/Power button and finally the clear button. The dialing pad has separated numbers and a very flat layout, therefore providing a rather haphazard travel experience. It does not even have back lighting. 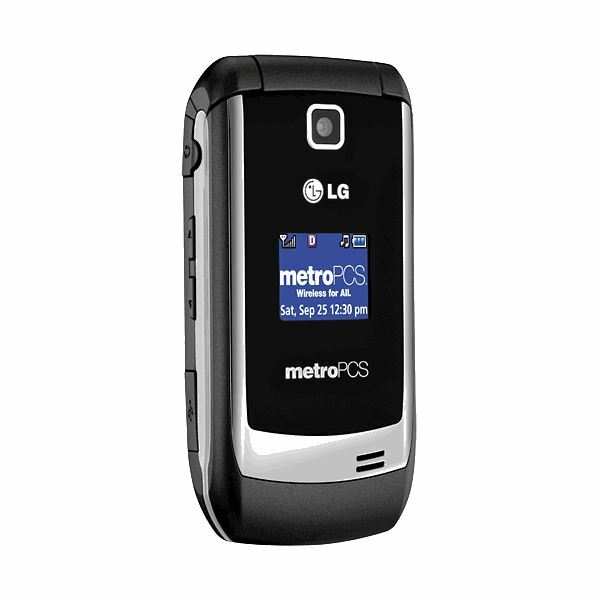 The LG Select uses MetroPCS's very ugly UI, but you can change it and customize a bit by using wallpapers and pre-loaded themes (you can also download more themes and wallpapers), and the main menu itself is easy to navigate with 12 icons organized into a grid. There didn't seem to be any option available to change the main menu style. Otherwise the entire interface moves smoothly with no hitches or glitches and you can assign your shortcuts of choice with any of the four-way navigational keys. The phone book is light on contacts, you can store as many as the 30 MB internal memory will allow, because this phone is technically a smartphone due to its underlying BREW system, but there are no options to add more memory whatsoever, so at best you get about 1,000 contacts with some room to spare for pictures and wallpapers. Messaging is catered for via SMS (with T9), IM and email, but no MMS. The email client works well and with most providers, the POP set up worked well with Gmail and Hotmail, but Yahoo was a bit of a problem. Overall it was an average experience with little to complain about. 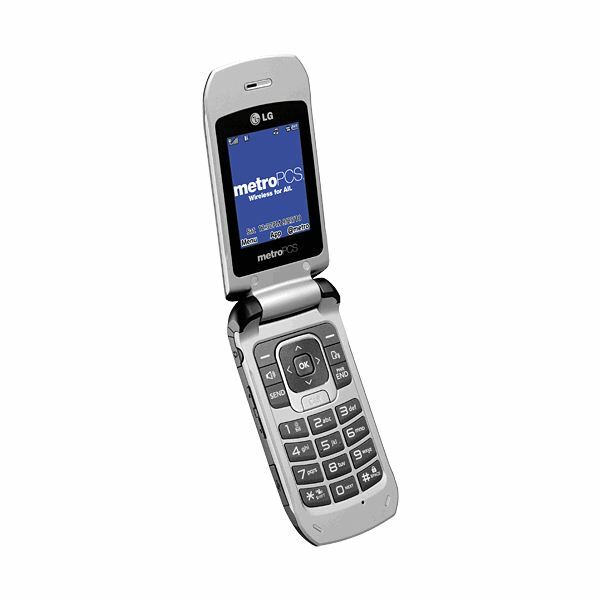 The phone stays connected via the CDMA 800 and 1700 set of frequencies, while there are no options for 3G or Wi-Fi. The only local connectivity options are Bluetooth 2.1 and microUSB 2.0, and to top it all off you have a measly 30 MB of internal memory and no microSD card slot. The 1.3 MP camera shoots pictures that just make you go "ugh", pictures are dry and lack any natural coloring, plus there is a sepia-ish tone with indoor pictures. Of course it goes without saying that there is no auto-focus or flash. Not much in the way of options either, you can choose from a couple of fun frames and adjust the zoom level and lighting. No apps… no I'm just kidding, the phone does have miscellaneous features such as an alarm clock, calendar, stopwatch, voice dialing, memo, currency converter, GPS, JAVA and a calculator. So far the phone has scored between average and poor, it better have something to redeem itself with as we check out the call quality, web browser and battery life. Call quality, when given the chance (e.g. strong signal area) is pretty good, voices sound clear and natural, while there may be the occasional static and callers may sound robotic, calls are generally acceptable — as long as there is a good signal. Drop two bars and suddenly things just become a jumbled mess of sounds, cuts and white noise. Despite the dedicated loudspeaker button, the loudspeaker performs so-so, you can hear calls in a crowded area well enough but the call quality will diminish any sense from the conversation. Overall the best use of this phone is somewhere quiet where there is a strong signal, otherwise it's pretty bad. The Myriad 6.2 browser is complete crap on the LG Select, pictures and web pages render blockily and sometimes they simply give up halfway, even if they do render fully you're not going to be seeing anything any day soon on a 2G network now are you? Plus zooming around on a web page is a complete nightmare, and the lack of tabs or anything else cool just makes you wonder why they bothered to put in Myriad at all. They should have simply pre-installed Opera Mini, which is something that should be done immediately if you ever intend to surf the net on this phone. The phone comes with a Li-Ion 1000 mAh battery that will last the day on heavy use, talk times are about 6 hours and 30 minutes while standby time is approximately 5 days, all in all, average use should easily get you through two days without the need to recharge. The LG Select is a sly phone, it's one of those phones you buy thinking "I'm just going to use it for calls and texting", and while it can do both, the other traits start to drag it down. Eventually the phone will start getting on your nerves every time you fire up the browser in an emergency, or suddenly find yourself in an area with less then utopian network coverage. The fact is this phone is simply not worth your money because the one thing it's supposed to do well (make calls) it does from average to bad, and strong signals are a rare thing. That means it comes directly in the line of fire from the Samsung Chrono, which is an all around cheaper and better phone with the same form factor as the LG Select.